Home of the top show Amstaff in SA from 2010 to 2013! The Amstaff is proud and noble of bearing. He combines power and grace and agility. He is bright and alert and has boundless courage. He is intelligent, outstandingly amenable to training and discipline, and adaptable to almost any conditions. He is intensely loyal and affectionate, has the striking good looks of a natural athlete, and his short sleek coat requires a minimum of care. In no other breed is there present such a remarkable combination of gentleness, camaraderie and reliability (extract from "The American Staffordshire Terrier Annual"). An Amstaff's personality and temperament is one of a loving and loyal family pet. They make an excellent guardian of property and family, and possess the ability to differentiate between strangers who mean them (or you) harm and those who do not. Their courage is proverbial. They have the terrier personality of tenacity, and a wonderful sense of humour. As with many breeds, they need an owner who is knowledgeable about animal behaviour, has a basic background in obedience training, and an understanding of terrier traits and personality. They make a wonderful companion and friend. The Amstaff has been used for generations as a general purpose farm dog, a catch dog for semi-wild pigs in South America, a guard and protection dog, and as a companion dog. The Amstaff's reliability around children is one of his most endearing and consistent qualities. The only thing that will break his spirit and his heart is lack of his owner's fond attention. The American Staffordshire Terrier's personality and temperament is one of a loving and loyal family pet, they are devoted, gentle and loving. Probably one of the most famous early Amstaffs was "Pete" of the Little Rascal movies. His trainer stated that Pete was one of the brightest, easiest to train dogs he had every worked with. The famed dog trainer William Koehler regards the Amstaff as one of the finest and most reliable of all breeds of dogs. The American Staffordshire Terrier was once considered an "all-American" dog. In fact, in World War I an Amstaff named Stubby earned the rank of sergeant and was the most decorated dog of the war. We chose the name “La Cosa Nostra” as it is the Italian for “our thing” or “this thing of ours”. And they are Aqua, Mason and Leia. We are proud owners of Amstaffs since 2001. We started breeding in 2005 with CH MANKOKO SILVER STREAK CGC (aka Tyke) & CH MANKOKO CLASSY CHASSY CGC (Madison). 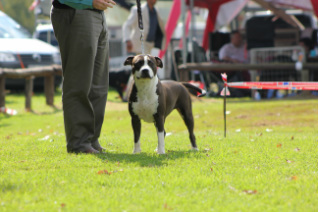 We are actively involved in showing our dogs at KUSA shows and our aim is to show and breed quality Amstaffs. For more information about our Kennel, the breed or available puppies, please do not hesitate to contact us.